We rolled out some improvements for how you track the topics you are interested in for your favorite Q&A sites. 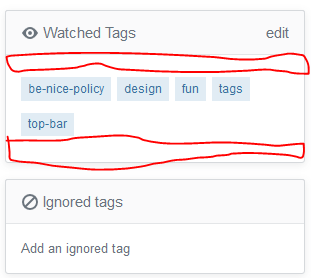 This feature used to be called Favorite Tags. We are renaming it Tag Watching. Naming is hard, but we think this better captures the value of the feature. There were a number of confusing elements to the old feature. We've attempted to clear these up and refocus the user experience on the core functionality. This feature is live as of today (07/26/2018) on all sites. We turned this on for all sites earlier than expected so that we could do some code cleanup. Cleaner pop up: new pop up is more focused on the key actions. 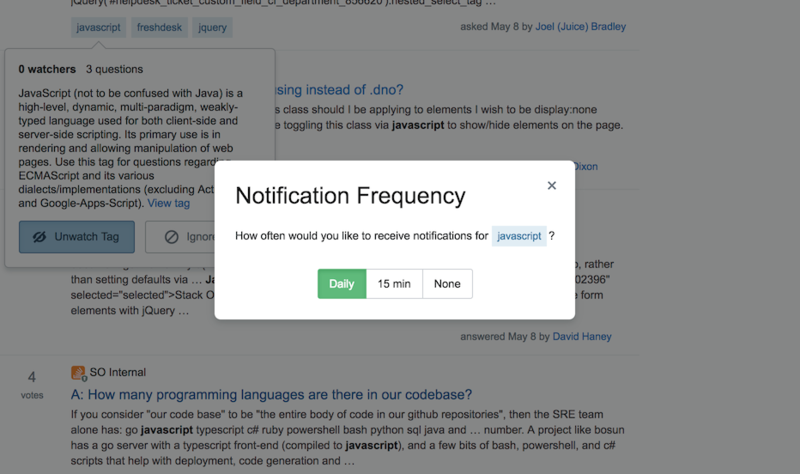 Notifications: When watching a tag you're prompted to set up notifications, if desired. Also, changing notification settings will be supported when you edit your watched tags in the right side bar. Now you see a description of the value tag watching provides. Our old tag pop up was very comprehensive and confusing. So many options. Watching/ignoring a tag was a tristate button (those are never a good option). An every action is essentially presented on equal footing. This makes it really hard for new users to understand what they can/should do. The new pop up is focused on two primary actions (watch or ignore tag) and two minor actions (view tag, access RSS). We have some work to make the notifications scale to SO. So, while these improvements are live for Teams users, they will be enabled later (timing TBD) for SO and the rest of the network. With the old system watching a tag and getting notifications were two separate steps. With the new experience, you will be prompted to set your notifications when you watch a tag. Also, changing your notifications will be integrated into the experience of editing your watched tags. As usual, we are happy to hear your constructive feedback. Feel free to post an answer below if you think of an improvement. 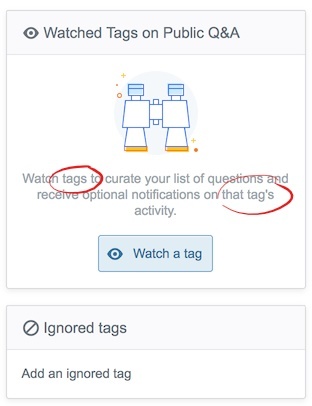 Watch a tag to curate your list of questions and receive optional notifications on that tag's activity. 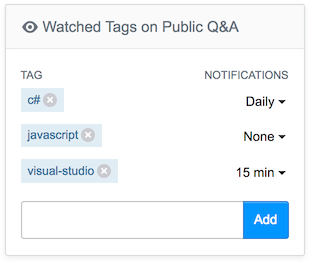 Watch tags to curate your list of questions and receive optional notifications on those tags' activity. or some third construction I'm not smart enough to notice. Please make the watched/hidden tag thing hidable/toggle-able, especially on the per-site metas. On the per-site metas, I imagine very few people want to watch/hide specific tags, so it'll likely be empty, and making it pop out like that is distracting and provides very little utility. Alternatively, you could consider removing the feature altogether on the per-site meta. The unwatch button in really inviting and asks to be pressed as 'main' action in the tag-section. This is OK if you accidentally added the tag, but for a normal workflow this is not what a user wants to do. Maybe just a grey button with blueish text is ok? In the new design the two sections having the title as Watched Tags and Ignored tags. In these for the Ignored tags, the tags can be replaced to Tags for uniformity. Also I can see Ignored Tags only in the Tag Watching & Ignoring page too. The new sidebar widget stands out (in a bad way) because it does not match the style of the existing widgets. Why not keep the style similar? In this system, what options do I have for dealing with tag conflicts, that is, with questions that have both an ignored tag and a watched tag? 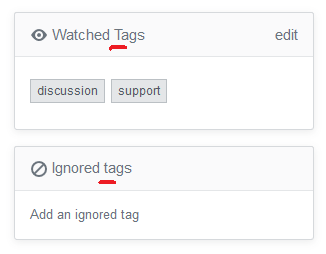 Apparently, the "ignored" tags have a higher weight than the "watched" tags – in my example, the ignored behavior causes the second line to gray out even though featured is watched. 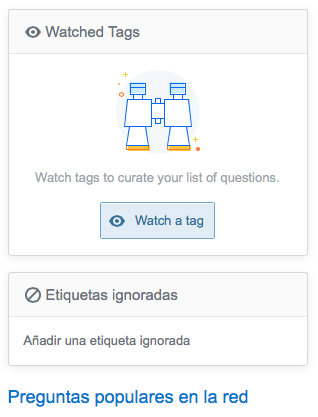 Can I have the option to specify that a particular "watched" tag should override any "ignored" tags on the same question, and prevent it from being grayed out or hidden? For an example, in SO I'm trying with mssql as on of the synonym of sql-server tag. But if I'm trying the same in the Tag Watching & Ignoring under the Edit Profile & Settings, it doesn't throw any error. The validation in the question's page can be applied in the Edit profile & settings page too? I really like this update. The tag description is easier to read and interact with, the layout is lighter, and makes Watched Tags more understandable in general. We can see that both java and vm have the same color tone, even though Java tag has almost 1000x watchers and 200x questions asked. On the other hand, the ruby-on-rails-3.2.1 tag is not colored, but it has almost the same watches as VM, and even more questions asked. In my mind, I would have expected the color to change (more intense or red) proportionally to the number of watchers and questions asked, similar to the way the vote counter on comment gets more orange/red as the counter increases. IMHO, this gives a better sense of the "hotness" of the tag, and can perhaps give a "wrong" impression of hotness (i.e. : VM being equally hot to Java when clearly it isn't, and Ruby not being hot when it got almost the same watchers and more questions). Jokes apart, I like improvement in popup and removing extra options from it. However, there are some concerns from me. 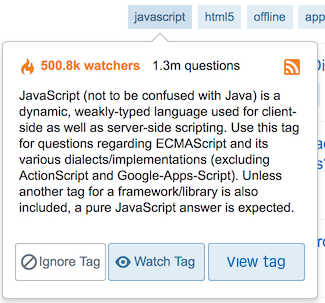 I think the dialogue boxes for watched and ignored tags are occupying more space on the page. I think this can be reduced by some margin. Note that it takes more space even when the tag names are smaller. There is white space above and below the tags. This can be removed a bit to reduce redundant space. This space is not present in current design. Some space can be saved by doing. This came up on MSO and I thought it was a good idea so I'm reposting it here. I'd go one step further than the OP's proposal, and remove the entire tag description block. We don't need this on every single page, forever! Who really needs a tag description permanently cluttering the space? If we made the [Python] clickable or hooverable, that'll amply do. The watch/unwatch/ignore/nore is already on the right side bar, it is not necessary there. Surely, there must be other, & better ways to induce people's goodwill to edit and improve tag definitions. This link has now been removed, to be restored in some way at some time in the future, per the question. This isn't a case of not-yet-met plans for future functionality; this is something that used to be available, isn't now, and is promised again for the future. The only thing I use tag favorites for right now is to get email about new questions in them. Can I still do that somehow? If not through the UI, then how? That "subscribe" link in my screenshot isn't a direct link; right-clicking on it in my browser doesn't offer me "copy link address" so I can get something to inspect. I don't see the link "Add an ignored tag" when I unignored my last tag. It is back after refreshing a page. Also, the "edit" button doesn't disappear when there is nothing to edit. This probably explains something I noticed the other day, I'm no longer to watch or ignore tags that do not exist (yet). Why would I want to do that? The answer lies between those parentheses. I want to be able to add tags that don't exist yet, but that I expect or hope to exist in the future. My home stack is Science Fiction & Fantasy. Let's say a highly anticipated new film is coming out, for instance a new Star Wars film. No questions have been asked about it yet, but the title is already known, so I know what the tag will be. I want to avoid spoilers as much as possible, so I want to ignore the projected tag. But now I can't do that any longer, since I can't ignore tags that do not exist! Another example would be following a tag of a favourite author about whom no questions have been asked yet, but I expect there aren't as many users having that same issue. Don't silently alter my existing tags, either! Additionally, I noticed that older non-existent tags had been silently removed from my list of favourite tags when I edited it to add another tag. I noticed and backed out without saving. Please don't do that. 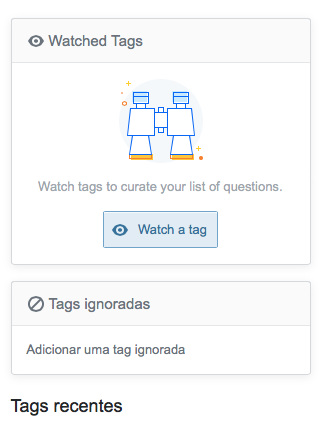 If one box gives me the option to "Watch a tag" and explains what that will let me do, the other one should let me "Ignore a tag" and explain what the consequences might be. (Honestly, I'd like to know.) The wording "Add an ignored tag" is super geeky, at best. Add it to what? Tomorrow's soup? I don't know what a notification might be, but I'd like to see a little marker beside the watched tag indicating that there is some unseen activity. And ideally, I'd like it to show up immediately, or a reasonable approximation. That's somewhat like the old new-nav tabs, except that the indications on those tabs were too fragile; they vanished on refresh. I'd like it to be like the markers on messages/rep: the marker stays until you act. Other than that, I was pretty fond of the nav tabs so I'm looking forward to getting something like them back. Could we have the "View tag" button more prominent? Style is up to you: I just want "View tag" as big as the other options. And if the size change isn't approved, could we instead adjust the position of "View tag" and "Watch Tag" to the right of the popup, for accessibility for right handed people? So... I actually find the new name more confusing. 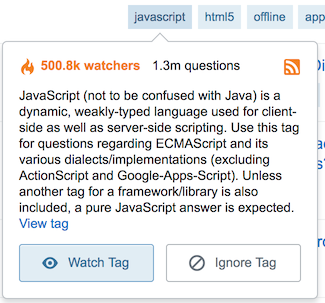 I would expect to be able to view "watched tags" in a question que (like the "New", "Unanswered", or "Interesting" tabs), because that is the closest behavior to "actively watching". I'm not flooded by pointless notifications if I take a week hiatus, and I can view questions up to however old I want, whenever I want. After pressing 'Edit' in the top right of 'Watched Tags', there is no way to revert back back to the previous state. Perhaps there should be a 'Done' button. 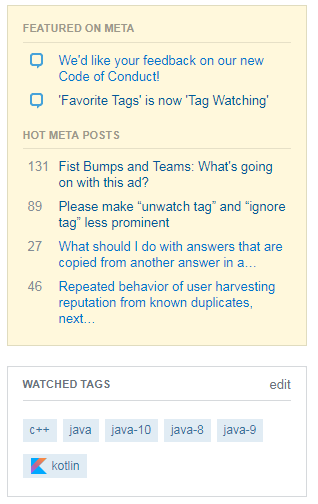 I get buttons to "Unwatch Tag" and "Ignore Tag". Why would I want to ignore it if I'm watching it? How can I watch it and ignore it at the same time? You mentioned something about a tristate link previously, but maybe that was more sensible/clear? I am unlikely to ignore a tag until after I have unwatched it, after all. And related: from this page, "Unwatch Tag" shouldn't be as prominent as it is an action I am not all together that likely to take compared to just editing my watched tags list. This seems to have somehow borked the Favorite Tags section on (some?) sites that haven’t changed to the new system yet. 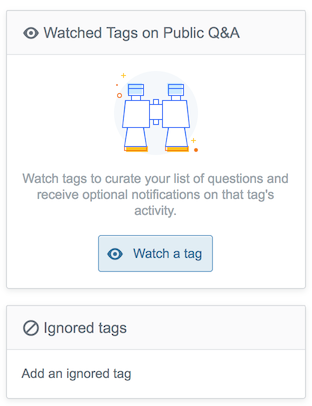 Watch tags to curate your list of questions and receive optional notifications on that tag's activity. There is, of course, the tags/tag's issue that nitsua60 has already dealt with admirablely. But the rest of the sentence contains some peculiarities as well. I have a list of questions that I am, moreover, curating? 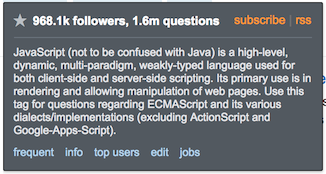 When I go to stack overflow.com, I am presented by a list of questions called "Top Questions". I can't say I've ever thought of them as "my questions". Right now, the top question deals is one tagged 'xamarin' -- which as far as I know is a kind of fruit. Have I 'curated' this list by setting 'cocoa', 'xml' and 'xcode', among others, as my Watched tags? As I understand it 'curate' has been gaining in popularity since museums started using it in their marketing, as in: a new exhibition curated by Hatsuko Mpufu von Schtottelheim-Chomborley. Which means that Hattie had a good look around the basements and picked some stuff. However, by watching a tag, I'm not really assembling a collection of great questions, am I? I'm just more likely to see some questions rather than others, regardless of their quality. Tags used to be labels, but now they've become actors as well? They're no longer the electronic equivalent of a hanger on a dog's collar, but they themselves go out sniffing for questions? Even metaphors get busy these days. This seems to have been rolled out without proper localizations. 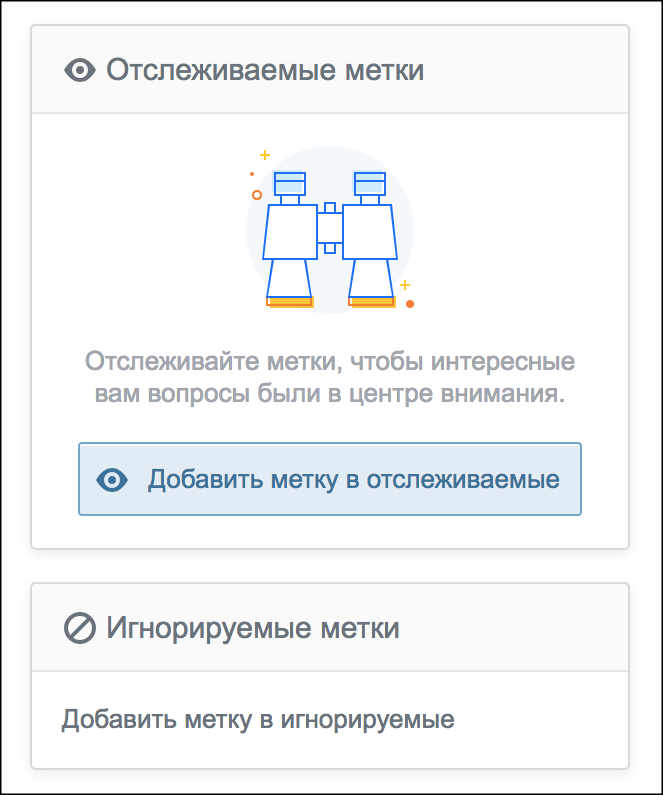 Could we please get these translated properly on all the sites that have a native UI? The font size of "edit" should not be bigger than the tags below. This would be consistent with the "edit" links for questions and answers which are also set in a smaller font size. 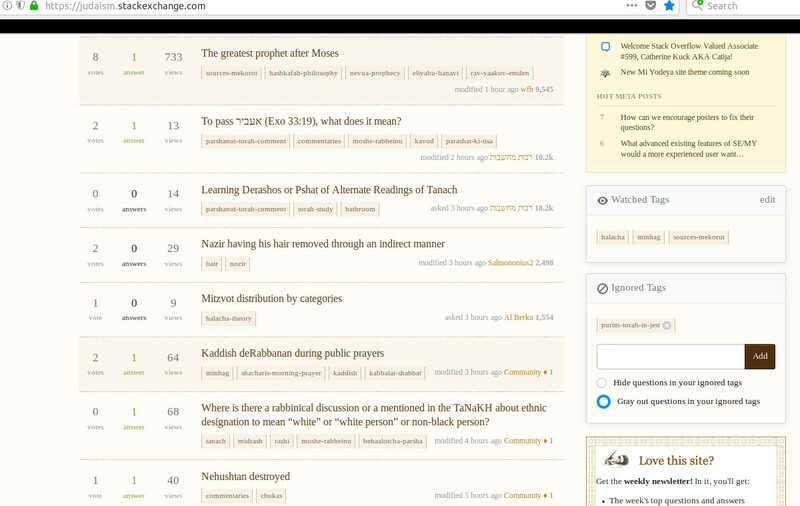 The questions containing a watched tag are highlighted, but that highlighting (at least on Judaism.SE) is very dull and is very hard to distinguish from the other questions. Another thing, although this may be a little nitpicking, but I think the highlighting (notice the blue highlighting around the radio button 'Gray out questions in your ignored tags' in the first image) should also be consistent with the site coloring. Not the answer you're looking for? Browse other questions tagged discussion announcements tag-watching . Is there a way to “watch” tags or groups of tags, other than an RSS feed of them? Can we merge [tag-watching] and [favorite-tags]?